When you need serious warmth, keep your dog toasty in our two-layer reversible Duluth Double Fleece. Dual layers of our unbelievably soft, stretchy fleece team up to create an unbelievably comfortable and warm coat for your dog. Our fleece has added spandex, recycled content that is eco-friendly, and it's machine washable! 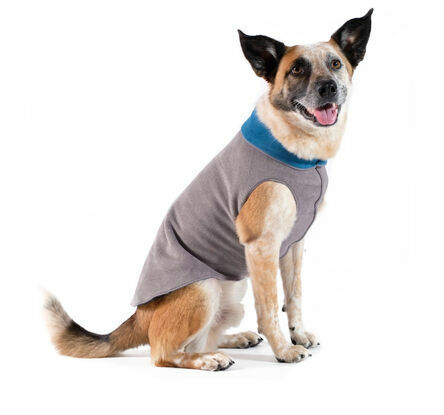 It’s an awesome garment for our deep winter doggies! Recommended For: Indoor wear, outdoor wear, cold weather, liners under heavy coats, protecting skin conditions or wounds, mild anxiety, keeping weight on senior animals, and calming puppies. Wear Tip: The center chest seam is designed to be on the outside – it’s a hefty seam and we wanted pets to enjoy maximum comfort especially in that tender area. Harness Help: These close fitting pullovers are perfect worn under a harness, with no adjustment needed. No fussing with ill-placed harness openings in this snuggy wonder! Plus, wearing this under a harness has an added benefit of reducing or eliminating chaffing! Washing Instructions: Machine wash warm, tumble dry low or hang to dry. Need help? Try our fitting guide. Seriously warm and soft! My schnoodle loves it! We have several of the single fleece and Portland pullovers (both of which are phenomenal) but this one is perfect for when it gets super cold. I love that it’s one piece (and I personally like that it doesn’t have a harness opening as his goes over it plus he often wears this indoors so I don’t have to take it on and off just to get at his harness) and easy to take care of. Thank you, Gold Paw!!! My elderly dogs love these sweaters! These are the only ones I’ve found that make them stop shivering. They are so soft and fit perfectly. Even the seams are soft and don’t rub under the legs. I have been searching for years for good sweaters that actually function as a sweater! I will never buy sweaters from anywhere else. Our 85 lb bully breed is basically bald and hates being cold. Because he is big chested, it is very difficult to find jackets, sweaters, or even harnesses that fit. The Duluth Double Fleece Pullover is the stuff of his dreams. First, the 26 fits well, in part because of the stretch. It’s streamlined enough that it fits under his harness when it’s really cold. Duke Ellington has tried to put it on himself (it sits on the back of a chair in the winter) he likes it that much. The only suggestion I can give is to offer a package deal because, you know, sometimes they need to be washed. I live in the Northeast and my dogs love walking in all types of weather. Well, my husband enjoys walking our dogs in all types of weather. 2 years ago I discovered these snug fitting stretch fleece . My dogs love them as much as I do! hey aren’t bulky so we don’t have to adjust harnesses. On very cold mornings we put their double fleece on them. They also fit nicely over pajamas making them too cute for words. This year I not only added to my fleece collection, I’m adding another Toy Poodle and I can’t wait to dress her. My only complaint is that the Snood doesn’t come in an extra small, but she’ll grow. I just purchased 2 of these for my boxers. I was looking for a jacket that was warm without velcro (velcro = the jackets being pulled off and thrown around like toys!) Love these! They are warm and stay on. My boy won’t even go outside in the cold without it! I saw the stretch fleece coat reviewed as one of several “great dog gifts” in The Whole Dog Journal, so checked this website. I have a female fawn-colored dobie who inherited allopecia along with her coat color. She is bare except for her head and legs. I’m forever looking for the best coats for her. I decided to try the Duluth Double Fleece pullover, the Santa Fe pullover, and the Sun Shield Tee. I live in the PNW with current temps at 20 deg so am using the Duluth Double for her right now. She LOVES it and so do I – wonderful cozy fit. I’ll use the Santa Fe pullover for spring and fall weather and the Sun Shield Tee in the summer when she loves to lay out in the sun. What an innovative design and I love that your company is a neighbor (I live in Washington State). I did have to cut a slit on the top of the pullovers and reinforce them so I could use them with her harness. You might consider offering slitted pullovers for back and chest attachments to harnesses. Thank you for a perfect solution to cold weather and dogs with allopecia!! Cozy! Wonderful! I love my stretch fleece! I got a double, 2 sided one and it’s thick and warm and well made. I’m rocking’ it! I have Chinese Crested Hairless dogs and boy do they get cold even here in No. Cal. I love the quality of the fabric and the style of the jackets that Gold Paw Series have come up with, they’re an ingenious design. My dogs love them and so do I, so easy to take on and off! Thank you so much for making them, they are worth every penny! I purchased one in Seattle for my Sophie, a 5lb Yorkie. She chills easily, and we live in rural Alaska. She wears this on cooler summer days and in the house during winter. I keep her coat long and it gets caught in velcro that is so common in dog clothes. We don’t have that problem with this pull over! We’ll definitely be purchasing more for her and her big brother, Mack the schnoodle. I bought one for my Jack Russell Terrier at a small pet goods store in the mountains in Colorado. She is getting old, and having a hard time staying warm. This jacket is wonderful! She won’t cooperate with me trying to take it off (to wash), she just wants to leave it on. I’m here to get a second one, and maybe a single fleece one too, so she can still have one when I’m washing. I rescued an abused and significantly underweight little guy from the pound. They believe he is part Chinese Crested and has little hair except for his long-haired ears. When I brought him home, he constantly trembled and felt really hot. The vet said it is because he has no body fat and I am simply feeling his metabolism at work. I found the Duluth Double Fleece at my locally owned pet shop. They only had one in a size 10 — the marine/robin egg combo. (I love that it is reversible!) Lewey hasn’t taken it off! When we go outside, I put his harness over it and a heavy wool coat over that. Thank goodness Lewey’s putting on some weight. I’m here to buy one in the next size. If he doesn’t get more hair in his coat, I’ll be back for more, probably even a single layer one for when the weather gets warmer. These are absolutely perfect for dachshunds. A little challenging to get the right size but once you do these are wonderful shirts that stay on and keeps the weenies warm. We’ve used them on our 4 dogs every winter for years. I do not usually write reviews, but the Duluth Double Fleece Pullover is fabulous! My chihuahua cross is still wearing his 24/7 here in NH. The pullover has four way stretch making it super comfortable and easy to put on/off and is made to last. It does not rub his fur anywhere and washes beautifully. He doesn’t mind running outside to do his business, as the fleece keeps him warm and dry. On cold days when we go for walks, I just slip his harness on over his fleece and then add a winter coat. Overall, the fleece is a super product. I highly recommend it! I want a million of these. This sweater is so soft and comfy and warm. Our dog loves it and wears it as a house sweater. Going to buy another one. Really nice quality. I have a tripod chi/mix. We have a stack of coats (I think I have bought almost every high end jacket out there) bc she refuses to walk in them. FINALLY I found a fleece she likes!!! She even enjoys wearing it in the house on cold days! I’m so happy! I bought a single fleece too but she prefers the double. THANK YOU!!! Just received our Duluth Double Fleece for our 7yo Boxer girl. Wow is this soft! She loves it!! We love the way it’s made – it seems to be put together well. We bought it for her for our harsh winters. She’s going to wear it in the house to keep her warm. Thank you for such a great fitting fleece that will keep our girl nice and warm! Wow! I just ordered a Duluth double fleece for our cattle dog, Gizmo, after seeing how warm it’s keeping our little Italian greyhound, Sophie. Great value and fabulous fit. Thank you! We bought two of these for our little dachshund. She loves them!! I am now back to buy for our other three fur babies. Thank you for a GREAT product!! I recieved this coat for riley. Riley just loves it. It is rainy here today and it is keepin him dry. He hates the rain. The fit is perfect. HE LOVED IT SO MUCH. We bought another for him in prints. Thank u so much. Wonderful item for my baby boy. He is 10 years old and gets cold very easy and of course he is the apple of our eye.